The final “Thai Fight” edition for the year was held this past Saturday (Dec. 22) in Nakhon Ratchasima, Thailand. Muay Thai event featured the championship bouts of four knockout tournaments, as well as a series of super fights. Famed Saenchai battled it out on the top of the bill. Saenchai faced Jamal Madani of Iran in the final round of 67 kg tournament. The contest went the distance ending in favor of “The King of Muay Thai” who earned a unanimous decision. In addition, he updated his streak to 44 wins in a row. Also on the night Satharnfah Sit-Nayok-Chai Songkla won 70 kg contest scoring a unanimous decision against Bobur Tagaev of Uzbekistan. His Thai-fellow Payak-Samui similarly defeated Yurik Davtyan of Russia and took all 72.5 kg eliminator. The scheduled 70 kg finale in Kard Chuek between Saensatharn and Oleksandr Moisa fell off. The latter “was granted a free pass as the winner of this match since Saensatharn Klong Suan Plu Resort has failed the medical requirement due to knee joint abscess,” reads the stated (via Facebook). Among other bouts PTT Sor.Pattanagas stopped Farhad Mandomi in the first round. Chanajon PK Saenchai Gym claimed a unanimous decision against Phil Engeroff. 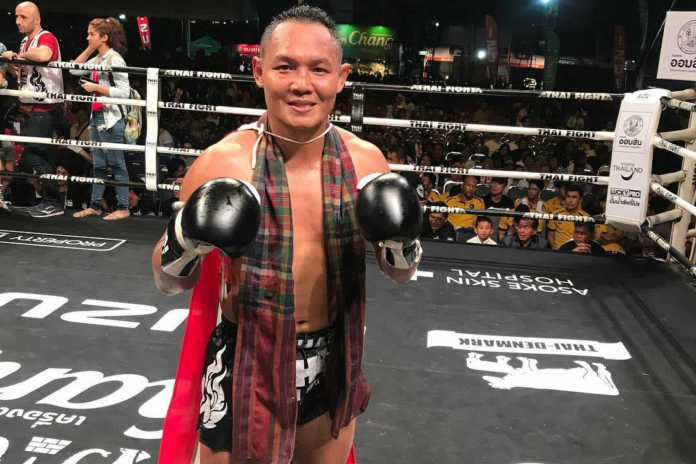 Kitti Sor Jor Danrayong and Ratchasing Rongreankeela-Korat scored the first-round knockout wins against Pasquale G Amoroso and Saeed Salehikhenari (respectively).